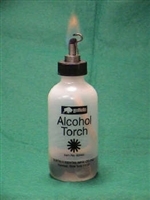 Buffalo alcohol torch produces a needle point flame with gentle pressure on the weighted plastic bottle. 5" high. Ideal for smoothing wax.